Scars from past cystic acne can diminish self-confidence. It is often a very frustrating problem for people because a single treatment does not create the results they want. It’s important for you to understand that acne scars can treated to achieve the best possible results for you by customizing different treatment options. You need to feel comfortable with your understanding of the types of scars you have and what you can expect with treatment. Acne scars can sap self-confidence, but treatment is possible with a little commitment and patience. Acne scars are due to loss of skin and soft tissue from past cystic acne. Tissue loss can range from the loss of surface skin (epidermis) in mild scarring, to deeper loss of the backbone of the skin (dermis) and the tissue under the skin (fat). Enlarged pores can also contribute to the depth and extensiveness of acne scarring. Active acne treatment can dry the skin of oil and moisture, and affect the integrity of skin which can also contribute to the severity of scarring and general loss of skin health. Acne scar treatment is generally not a single procedure. There is no single definitive method that works for all people. The first step of acne scar treatment is proper diagnosis. Dr. Prasad will take special photos using a method called “back lighting” to show you the levels of the scars and he will educate you about the types of scars you have. After you are informed about the types of scars you have, Dr. Prasad will develop for you a customized treatment plan. It’s not unusual for people suffering from acne scars to want immediate results. Unfortunately, this is not realistic and over aggressive treatment can actually lead to damaging your skin further. We’ve observed that frustration from acne scar treatment often leads people to change doctors or even go to a practitioner with limited knowledge and experience who then uses a device such as a laser in a way that is ineffective or worse, damaging. The basic strategy of acne scar treatment is to treat, wait to allow for healing and recovery, assess the results, and then treat based on the results. 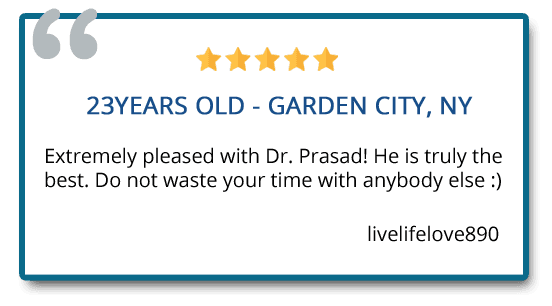 This is clinical medicine and is why Dr. Prasad continues to make assessments to guide you toward an optimal result. Acne scar treatment is not a “once size fits all” treatment that works the same on everyone. Factors that contribute to determining the right individual treatment plan include: skin color (amount of pigment), skin type, depth of scars, age of scars, age of the patient, current skin quality and skin thickness, patient age, gender, and past treatments used. 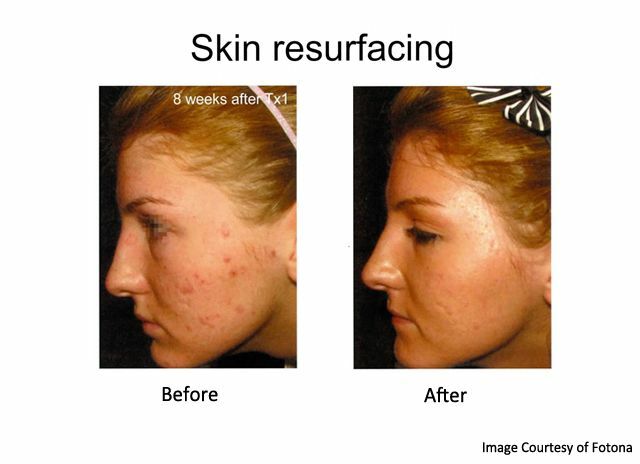 Acne scar treatments range from laser skin tightening; laser resurfacing; chemical peels, microdermabrasion or HydraFacial for surface skin renewal; subcision (surgical release of scars), platelet-rich plasma for collagen generation and skin quality improvement; microneedling; and cosmetic fillers to fill deep scars. Depending on the individual, a combination of some to all of these treatments may be needed in various amounts and aggressiveness. Subcision is the process of releasing acne scar tissue from the dermis. This involves using a special blunt cannula-type tool, or a special needle to go underneath the skin to release scar tissue directly underneath the scar. 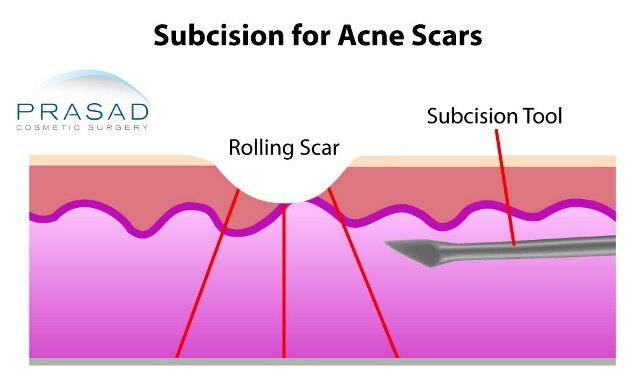 Subcision is used for deep pitted, rolling acne scars where the surface of the scar is tethered to deeper scar tissue at the dermis. Once the surface scar is released from the deeper scar tissue at the dermis, the depth of the scar is reduced. However, because of the previous loss of tissue, volume augmentation is generally needed to fill the area where tissue was lost causing the depressed scar. With subcision release of the scar, there is still a volume deficit from previous tissue loss. Volume augmentation is needed to support the skin and fill the depth left from lost facial tissue from acne scars. Injectable cosmetic fillers such as Restylane or Juvederm are applied in specific amounts in the dermal and subdermal layer to improve scar depth. Cosmetic fillers such as Restylane or Juvederm can fill deep acne scars due to loss of skin, dermis, fat, and other tissue. Subcision can actually be performed simultaneously as filler application. In this situation, the needle of the filler syringe is used as a subcision tool to release the scar tissue, followed by the filler placed in the pitted area. Fillers can treat specific acne scars such as atrophic scars (sunken or deep pitted scars due to collagen destruction) and tethered scars (attached to deeper dermis and requires subcision). Lasers can improve skin quality and tautness, but generating collagen with lasers will not do much for very deep scars compared to fillers. One of the best advantages of using fillers for acne scars are the fact they can improve the appearance of scars immediately, and with virtually no downtime. 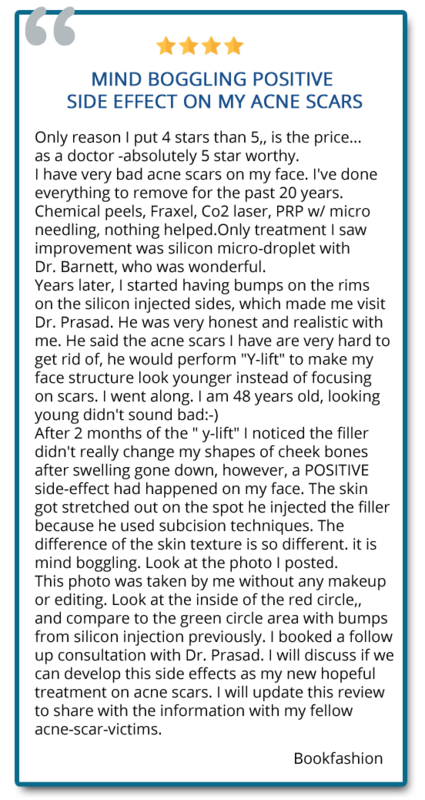 Fillers cannot treat every type of scar. Fillers are often used in combination with other treatments, such as lasers, PRP, and TCA peels. There may be differing recovery times based on the type of treatment. Fat grafting can also be used in areas with thicker skin such as the cheeks. Fat grafting requires harvesting of fat with liposuction and placement with some recovery time. One significant challenge with fat is predictability of result. 30-70% of fat can be absorbed and it is typical to need more than one procedure for maximal benefit. Platelet rich plasma also referred to as “PRP” is a concentration of healing factors from your own blood to stimulate your body to produce collagen, increased blood supply as well as improvement and increase in the fat cells seen with healthy skin. 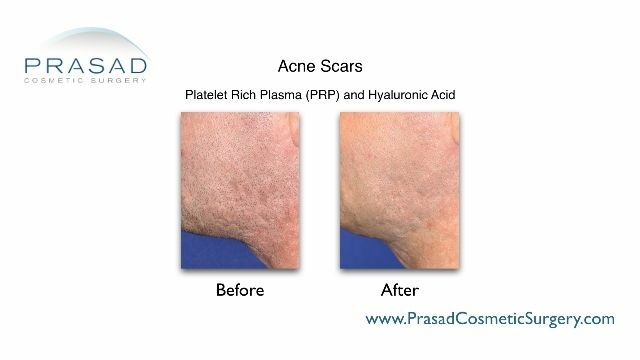 Platelet-rich plasma (PRP) can be used in combination with other acne scar treatments. For example,microneedling with a device such as a Dermapen, tiny channels are created through the skin, PRP can be applied on the skin surface to allow it pass through to the deeper layers. PRP can also be injected directly beneath the skin. PRP can also be used in conjunction with cosmetic fillers to improve skin quality, and provide volume for deep scars. PRP is also used as a topical healing agent after laser skin resurfacing for acne treatment. When injected directly to specific areas, PRP helps improve the volume blood supply and healing proteins such collagen. 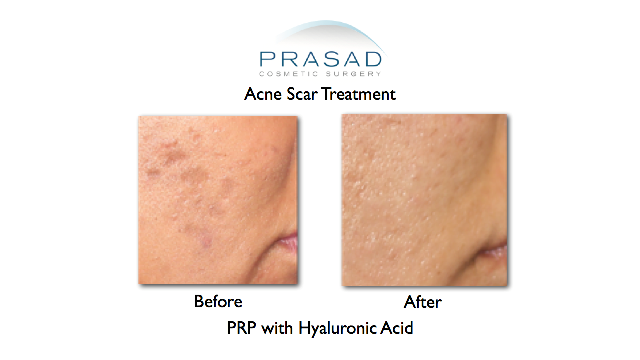 PRP helps tissue healing as well as pigmentation caused by scarring or trauma. Laser resurfacing is frequently used for acne scar treatment when the scars are relatively the same depth, such as shallower scars or boxcar scars. Lasers are used to level scars through partial or full ablation of the top layers of skin to allow for a fresh, smooth layer of skin to come in. The heat of the laser also stimulates an injury response within the deeper layer of skin (dermis) to produce collagen. It is the loss or destruction of collagen in the dermis that results in the scars. Producing new collagen in the injury response to heat treat improves the overall quality of the skin within and around the scar. Laser treatments can be widely used in lighter skin types,. In darker skin however, these types of laser may cause hyperpigmentation (skin darkening) or hypopigmentation (loss of skin pigment) so application of these lasers must be used done cautiously or not at all. Lasers are often used for acne scars which are shallow to medium depth where the depths of the scars at about the same level, such as is often seen in boxcar scars. Deeper scars don’t respond in the same way to laser resurfacing because it is too unsafe to resurface the skin to the depth of deep scars. Deep scars are best treated with subcision, acne scar surgery, or TCA cross (in the case of icepick scars). Most lasers can be used safely for lighter skin types, but it is important that the right laser or combination of lasers be used to get the most optimal result. For lighter skin types, we use fractional erbium and CO2 laser as well as ND:Yag, and Q Switch lasers. For darker skin types from Mediterranean, olive skin, to Asian skin types, we use ND:Yag, Erbium, and Q Switch lasers, as well as radiofrequency devices such as Pelleve for more gentle heating. For even darker skin types such as African or Arabian skin, we approach these on case-to-case basis. Some darker skinned people may react to laser treatment with hyperpigmentation of the skin, as well as scarring, so in some cases no laser or thermal energy treatments can be used. In such cases, we treat acne scars with options such as chemical peels to resurface the skin, platelet-rich plasma (PRP) for skin improvement, and cosmetic fillers. Some acne scarring does not involve deep pitted or depressed scars, but rather skin discolorations such as red or brown spots. These spots can be treated with less aggressive laser protocols like the 1064 YAG or the Q switch QX Max with minimal downtime. Platelet-rich plasma can also be used to treat dark spots by helping heal the scarred area and increasing collagen and blood circulation into the localized spot. 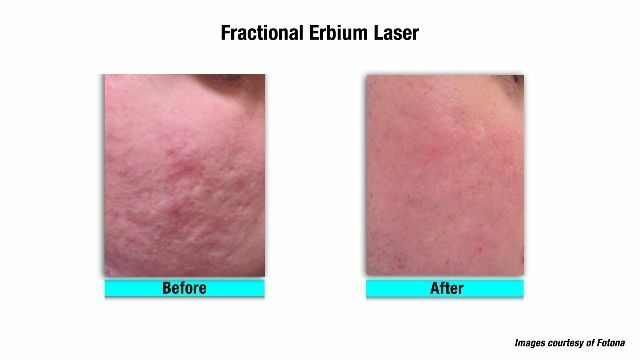 Fully ablative CO2 and Erbium lasers were the standard for acne scar laser treatment before the introduction of fractional lasers. Full ablation is an aggressive technique that completely removes, or ablates, the top layer of skin (epidermis and dermis) so a new layer can grow in, and triggers a collagen response in the backbone of the skin (dermis) as a response to the injury. The fully exposed dermis leaves the skin with a very raw appearance, which can appear anywhere from dark pink, red, or even light brown. This red and raw appearance is the biggest drawback of fully ablative laser treatment as downtime can extensive – patients have to avoid being outside for the first week because of potential side effects from sun exposure to the raw skin. The raw appearance can last for over a week, making fully ablative laser resurfacing less popular for busy, working people. The advantages of fully ablative laser resurfacing are the level of results and long term benefit. There is no need for a series of treatment sessions. The fully ablative procedure only requires one treatment session, followed by longer downtime when compared to a non-ablative or partially ablative procedure that has little to no downtime, but requires multiple treatment sessions. It can be argued that the results of a fully ablative procedure are better and more thorough, but multiple non-ablative procedures can achieve comparable results. Trichloroacetic acid (TCA) is a non-toxic chemical that is related to vinegar. TCA peels have long been the standard of skin resurfacing before the advent of laser technology and laser resurfacing. A TCA peel can be used for renewing the outer surface of the skin (epidermis) with the same principles of fully ablative to partially ablative treatment as lasers. The treatment depth of a TCA peel depends on the concentration of TCA, which can range from 15% to 50%. Also, manipulating the the TCA solution by extent of rubbing or placement on the skin can also affect the depth of the treatment. The TCA cross is a unique way of treating deep acne scars. A tiny amount of high concentration TCA is placed directly onto medium depth acne scars. The TCA cross leaves a white spot on the treated area for about 3 hours, while redness of the skin lasts about 5-7 days. This process raises the depth of acne scars, making it an effective option for deeper acne scars, but it still need additional cosmetic filler to support the raised scar. 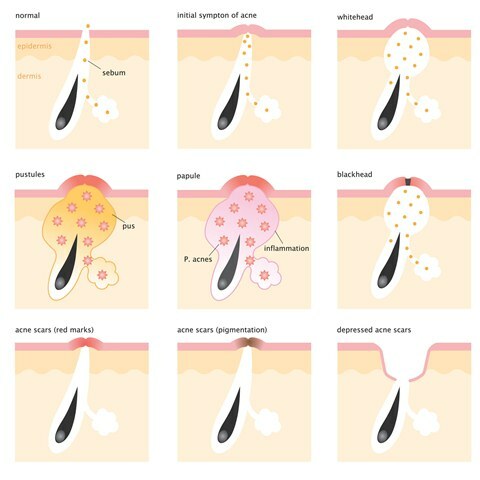 TCA can be used, but in different treatment techniques, from more uniform acne scarring at shallower depths with a TCA peel, to deeper scars with a TCA cross. 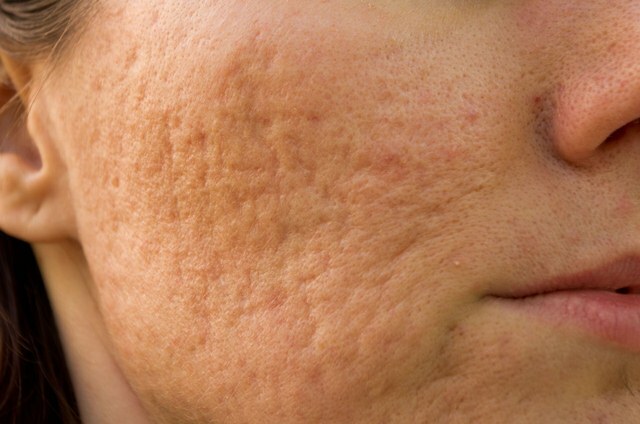 Linear acne scars, or longer acne scars, tend to be a more severe form of acne scarring due to being longer and larger. The treatment of larger scars include a combination of the previously mentioned acne scar treatments, but also involve surgical closure of the scar. When dealing with bigger linear scars, it is important to choose a doctor based on surgical skill and the prevention of forming bigger scars. Cosmetic surgeons are chosen for acne scar surgery because of their extensive experience in surgical closure to maximize the cosmetic results. 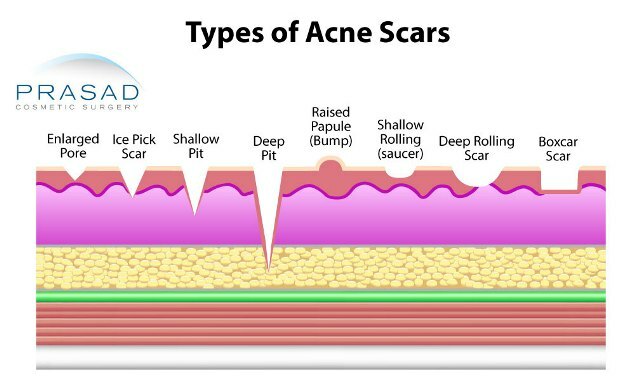 Contact us today for an evaluation of your acne scarring by Dr. Prasad. He will develop a customized treatment plan for you. Fill out the contact form below, and we will get back to you shortly, or call contact form below, or by call (212) 265-8877 for our Manhattan location, or (516) 742-4636 at Garden City, Long Island.